Cloth handkerchief invitations seem to me to be the perfect compliment to any event with a vintage air. From bridal showers, to weddings and save the dates, and even more perfect, a traditional tea party! I picture fancy flower adorned tea mugs, mason jars filled with icy lemonade and fresh mint - kid gloves and petticoat and gorgeous fruit basket center pieces. You can take a cloth hanky invitation idea and use it to suit any sort of party! I chose to go with a handkerchief created from printable fabric sheets. That's right! You can actually buy sheets of fabric designed to send through your inkjet printer. 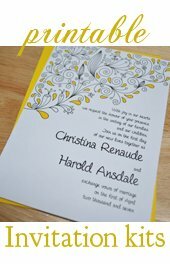 To create the invitations featured here, I simply bought myself a package of printable fabric sheets and printed my design onto them. You could duplicate these same kind of invites using Photoshop or even a free online software such as Paint.net or Pixlr. Do an online search for stock photography, or illustrations, or even create your own artwork. 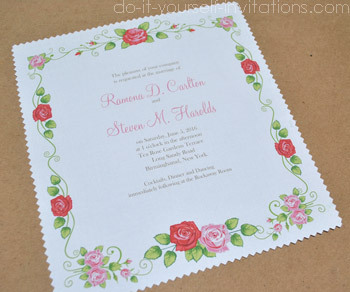 You could also opt for using our very own printable template kit to make your own handkerchief invitations! 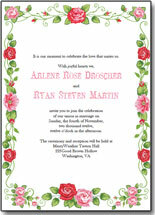 I designed my invitations on photoshop using some graphics I had on hand. I printed them at the highest quality settings for my printer, and then went on add a decorative border by cutting the edges with pinking sheers. This is about the easiest way you go about creating these invites. If you have a sewing machine and are handy with it, adding some decorative border stitching is a great way to add very fancy detailing to the borders of your handkerchief invitations. Many sewing machines have several decorative stitching options to choose form, but in my opinion, even a simple straight stitch can add a beautiful detail in a wisely chosen, contrasting thread color. For anyone skilled with embroidery, adding a few ell placed embroidered flowers can make and outstanding, eye catching embellishment to any fabric invitations. The only downside? It will take a really long time to finish. But if you have the time and patience, a small guest list, or a team of friends who embroider - would be a great option! Block printing is a very inexpensive and creative way to create semi-rustic block prints. You can even make your own using a lino block, print foam, or even a potato cut in half and left to dry. 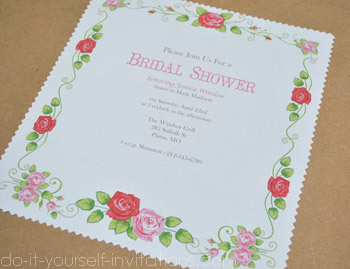 Stencils will create a very pretty rustic or country style hand printed handkerchief invitation. You can buy stencils to work with form a local craft store, or even make your own. 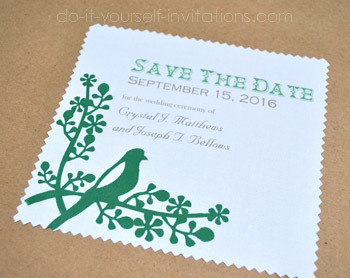 I experimented with creating my own stencil to make a fabric handkerchief Save The Date invitation, by making a stencil using my Silhouette personal die cutting machine and their fabric starter kit. The prints came out well but I would not recommend using this method for a large quantity of invitations. The process basically consists of using the Silhouette to cut a stencil from adhesive backed vinyl. You then transfer the vinyl to the surface you wish to transfer an image. I do however, recommend using the silhouette for things like out of town guest bag stenciling, or making decorative table runners!